Step back into the past. 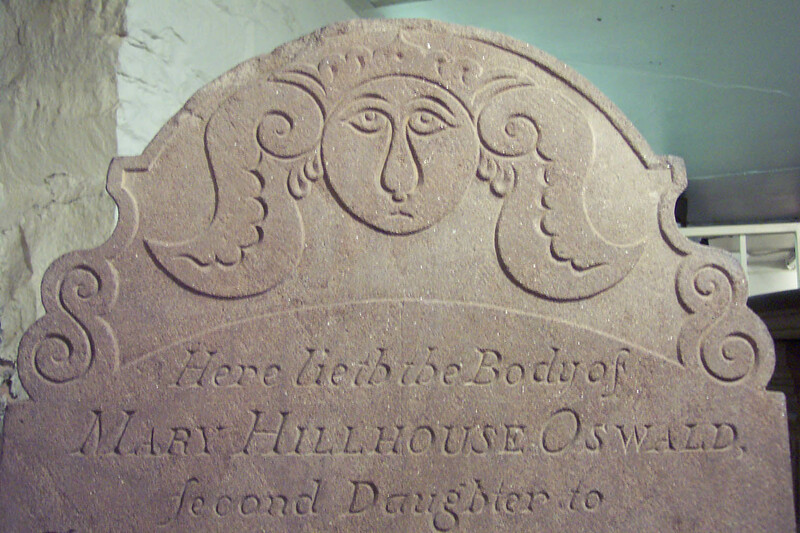 In 1812-1814, a fourth meeting house, the current Center Church meeting house, was built over a small portion of the town’s burial ground. 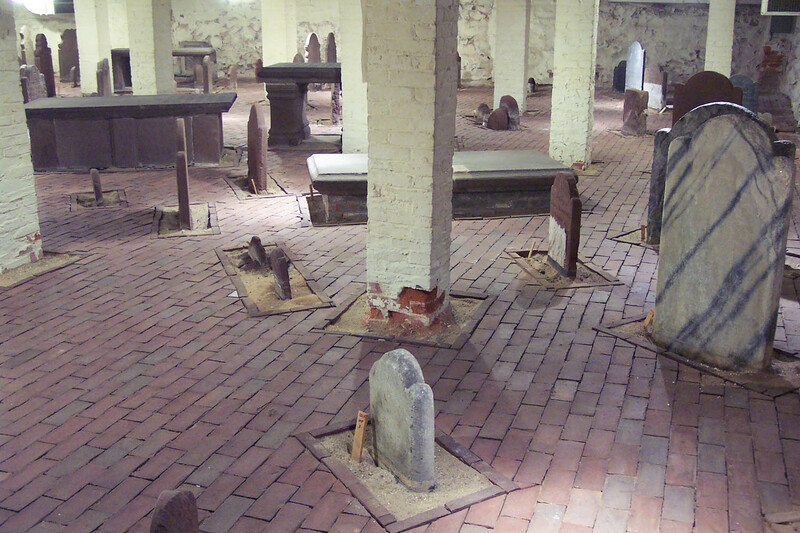 All the remains and gravestones were left in their original positions to be protected by the church’s foundation where a crypt, an enclosed chamber around the burial ground, was created. 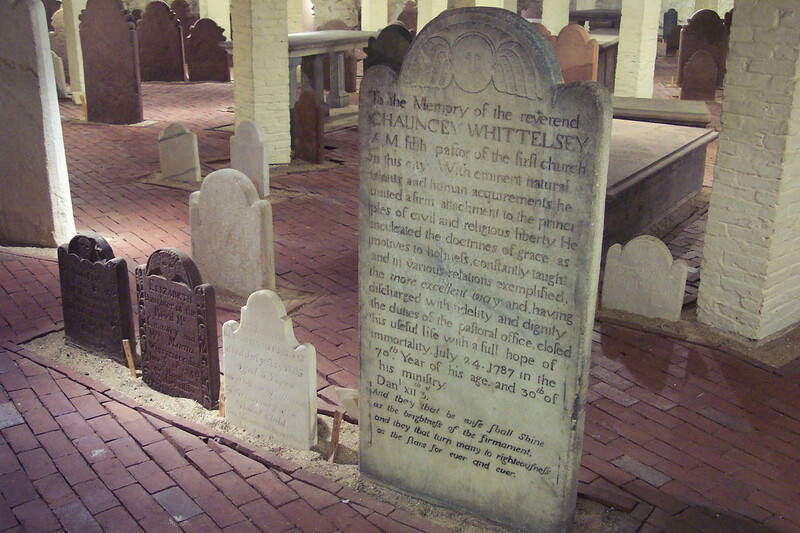 Historically, the New Haven Crypt is one of the exceptional colonial burial grounds to endure untouched. 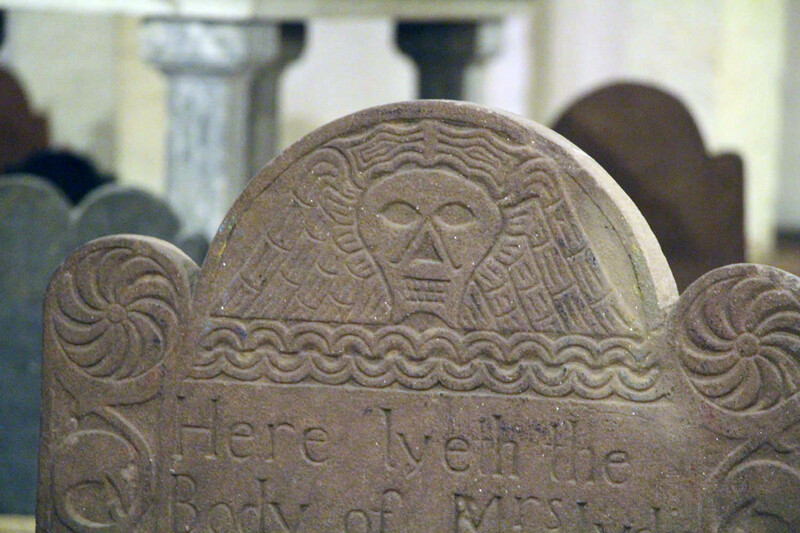 The Crypt is a rich source of information on the early days of New Haven and a resource for understanding what makes this city unique today. 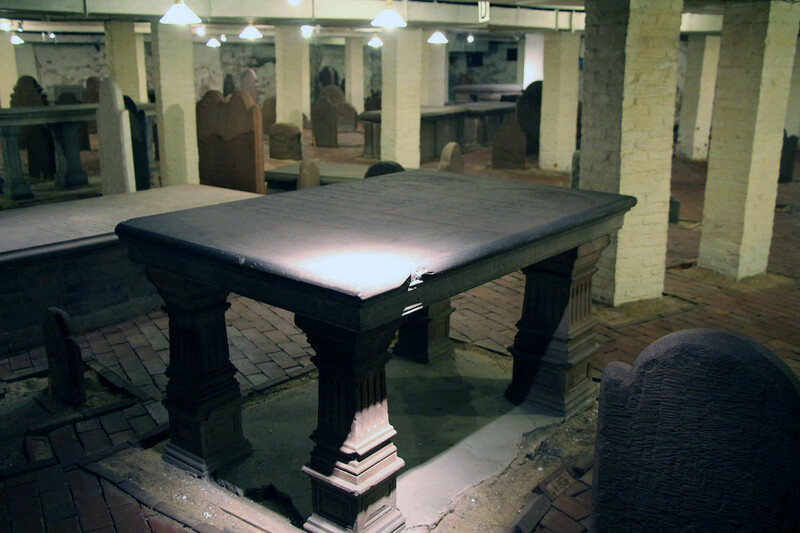 The early settlers who are remembered in the Crypt represent a cross-section of the original community: different social standing, different points of view. April – October: Saturdays 11:00 a.m. – 1:00 p.m.
For a full tour, please arrive no later than 12:40PM. For large groups, please contact us for an appointment. 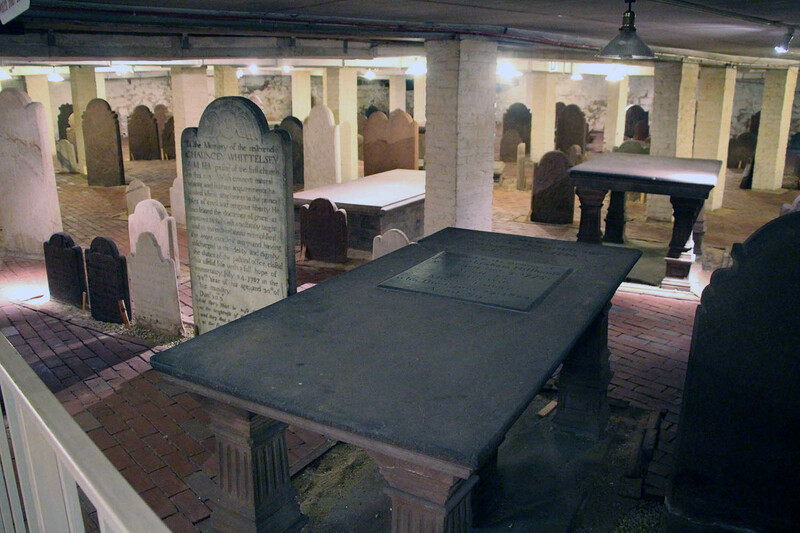 The Center Church Crypt marks the last remaining evidence of the early settlers of the New Haven Colony who were buried on the Green. 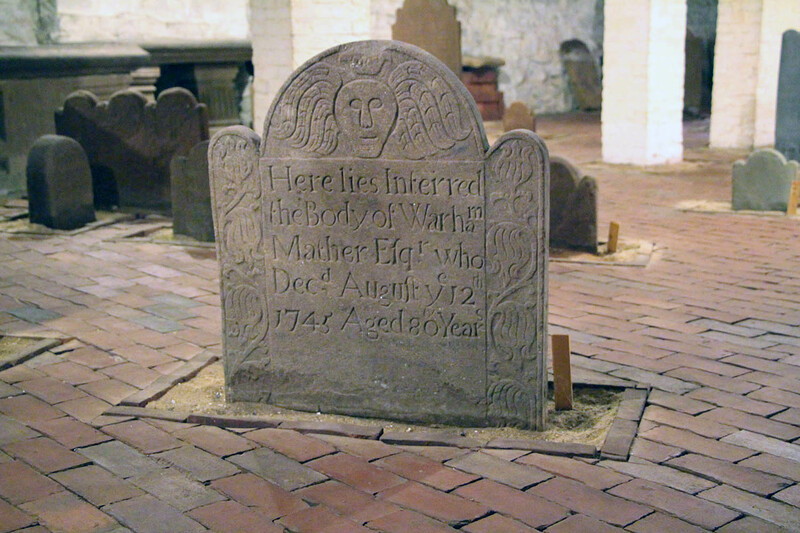 The headstones in The Crypt are deteriorating due to the seepage of water and the passage of time. 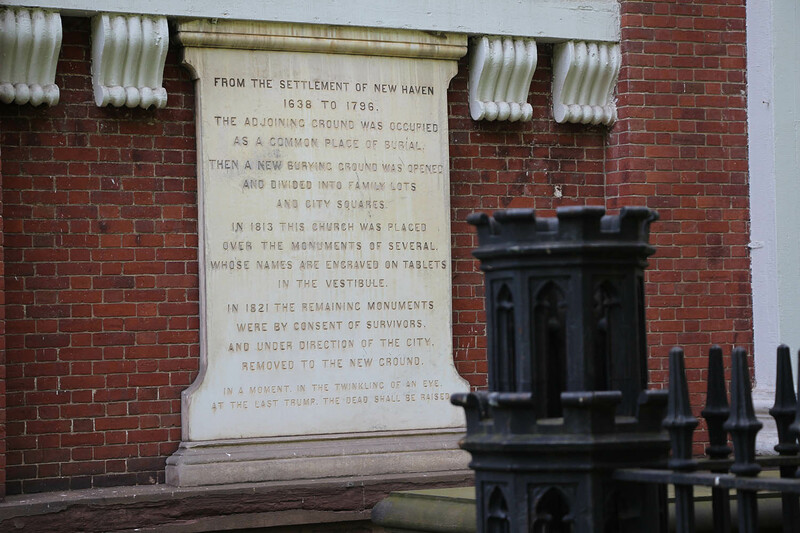 Immediate action is necessary in order to preserve New Haven’s history or it may be lost forever. Please help us preserve the past for the future by donating. The area of the upper Green contains more than 5,000 unidentified remains of many of the settlers of this colony of New Haven. 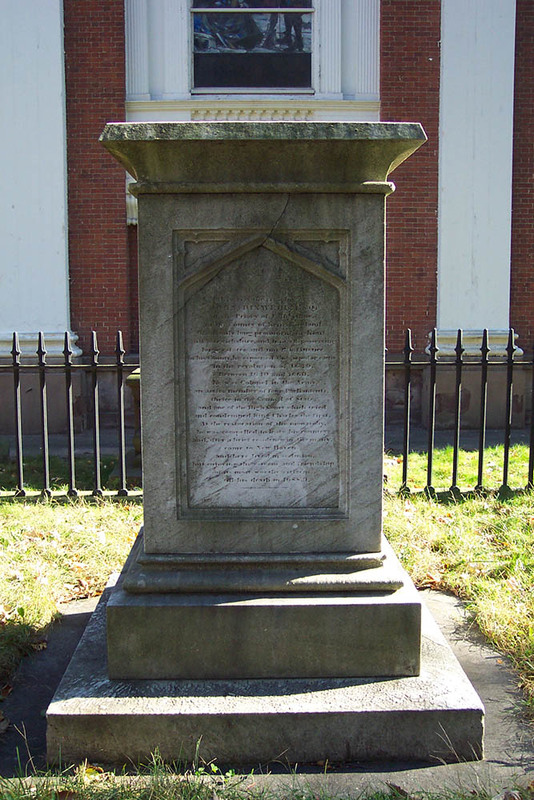 Center Church was built over a portion of this early colonial cemetery, with construction beginning in 1812 and finishing in 1814. 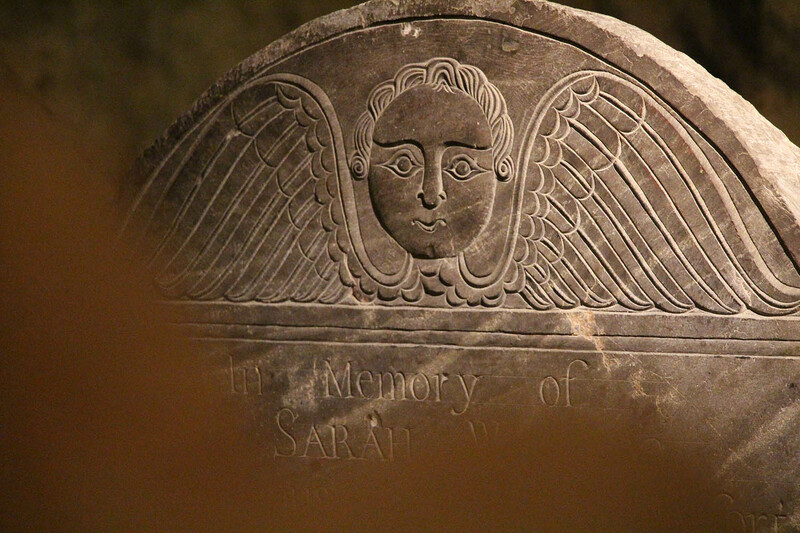 Beneath the church, The Crypt contains the identified remains of about 137 people, and the likely remains of over 1,000 that are unidentified. 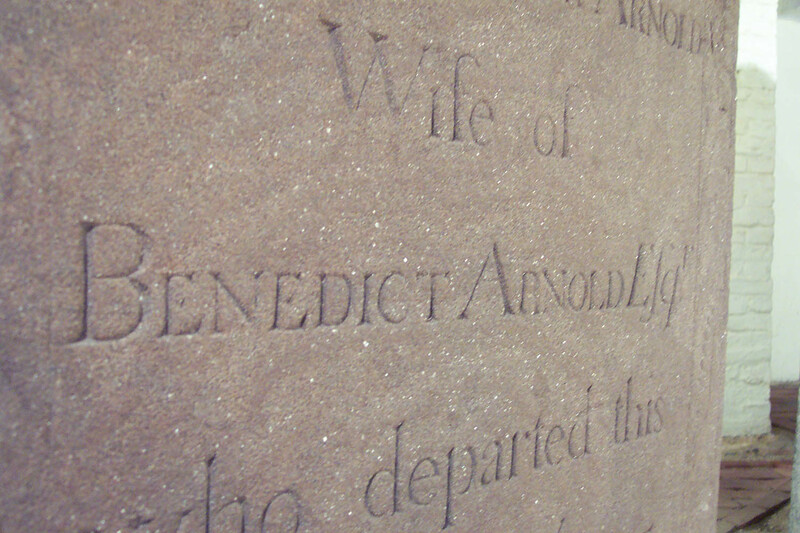 Buried in The Crypt are the remains of Margaret Arnold; the first wife of Benedict Arnold. 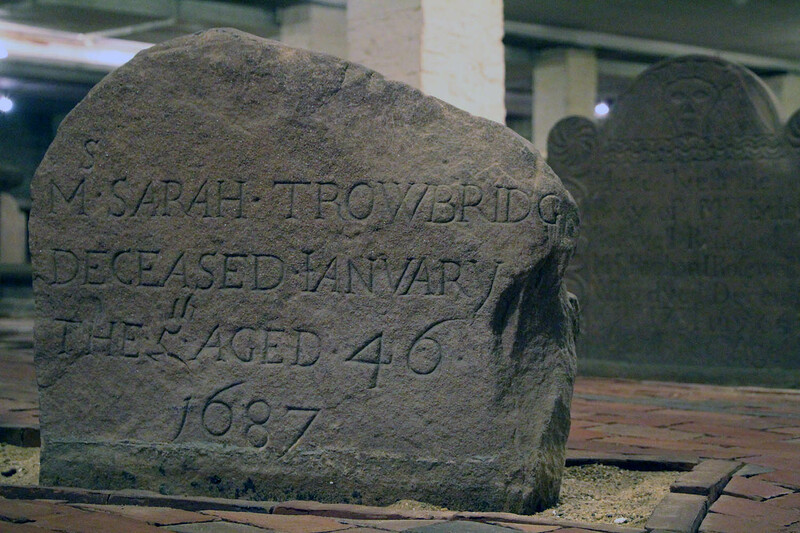 Also in The Crypt: Sarah Rutherford Trowbridge, who has the oldest dated stone in The Crypt, dating back to 1687. President Rutherford B. Hayes visited Center Church in 1880 and viewed the burial site of his grandmother and aunt, who are buried in The Crypt. 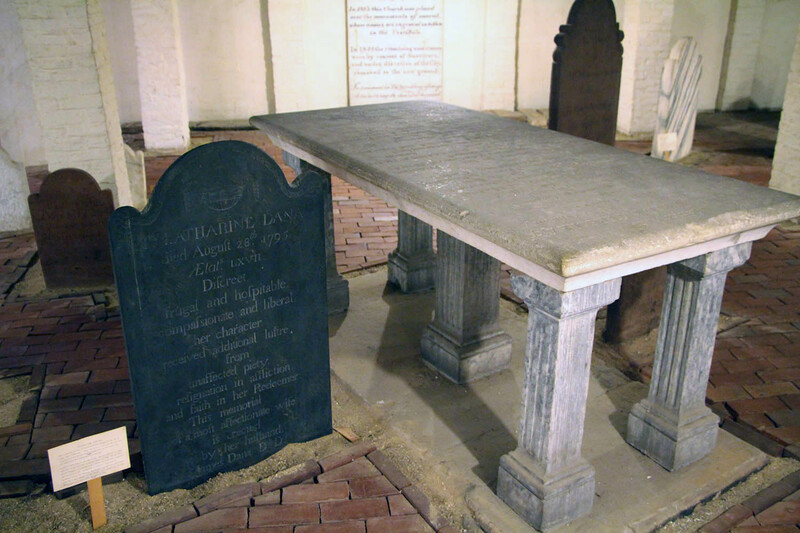 Theophilus Eaton, one of the founders of New Haven and the church, and for nineteen years the governor of New Haven Colony, is buried near the foundation of the Crypt. In 1879 the dirt floor was paved with cement. In 1985, it was realized by many experts in the field that a serious water problem was destroying some of the stones. The decision was made in 1987 that the concrete floor was capping moisture in the ground, causing the stones to act as wicks. In 1990, the concrete floor was removed and an uncemented brick floor was laid in place, allowing the moisture to escape between the bricks. Many of the stones, in spite of the deterioration of others, are as sharp and clear as if they were carved yesterday. 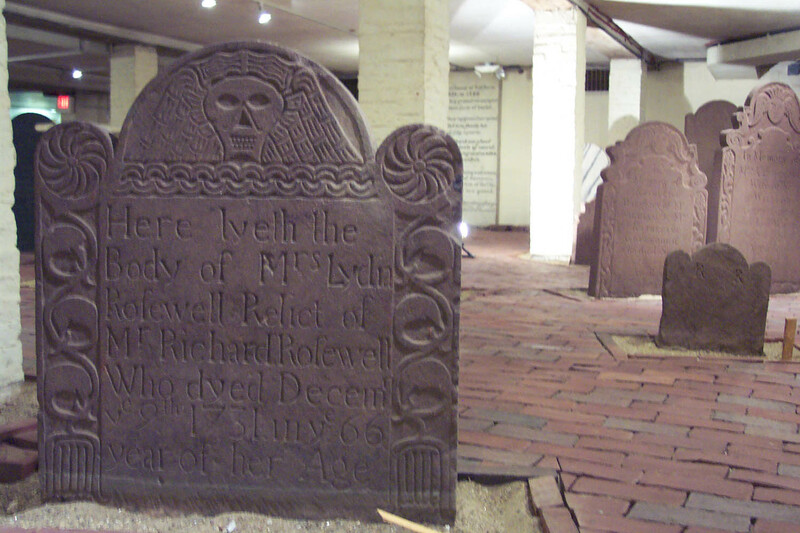 The Crypt is declared unique in all of New England by many historical preservationists, because it has been protected by the church for over 200 years. Fifty stones have been stabilized, but much more work needs to be done in this area before this treasure chest, which is rich in religious beliefs, history, education, art and culture can be preserved for future generations. 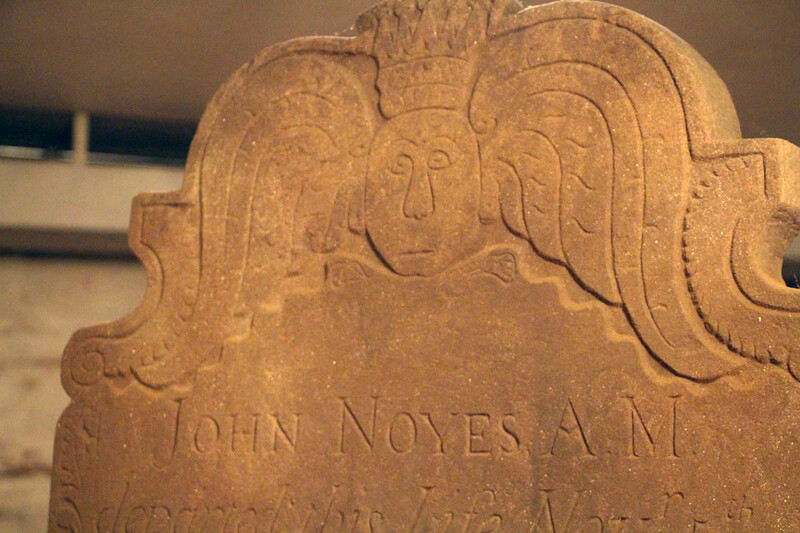 The New Haven Crypt Association Inc. is responsible for the restoration and preservation work in the Crypt.